Outdoors * Arts * Farm/Ag Tours * Events scroll down for more. 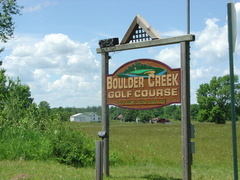 18 Hole Course between Ironwood and Bessemer on Country Club Road (WALMART LIGHT) just South of US 2. Salmon Fishing Charters, Mt. bike trails, Kayak trips, Waterfalls, Hiking. 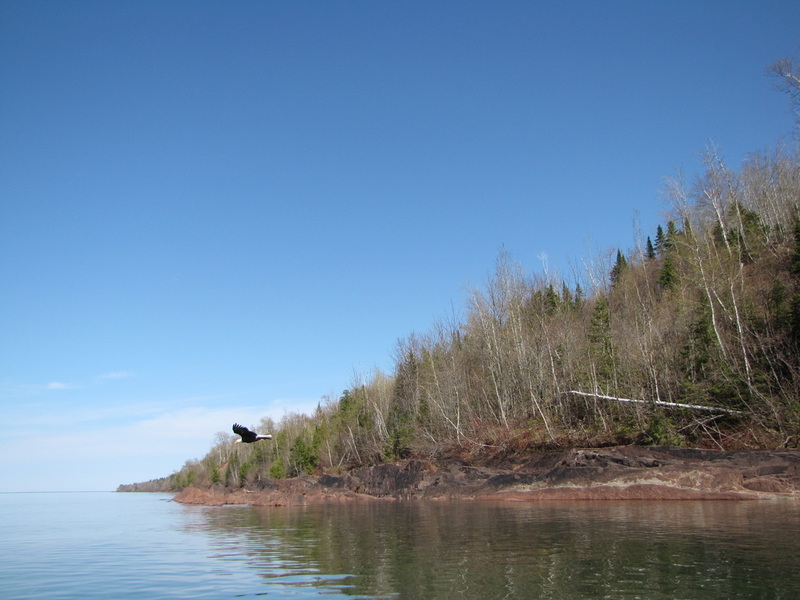 Sport Fishing just down Black River Road at Lake Superior where our boat is docked as well. Capt. Dan's Charter leaves from Black River Harbor. Trout fishing in Black River & great fishing lakes are abundant. Porcupine Mountains Wilderness State Park, Lake of the Clouds, Presque Isle, Summit Peak, Mirror Lake. 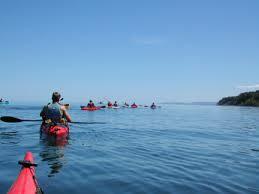 Mountain Biking, kayaking, fishing, hunting, birding and wildlife. Click through link for rates or call to make reservation. Hiking, biking, mt. bike trails for all levels of riding and day trips. Thousands of miles of national and state forest trails. 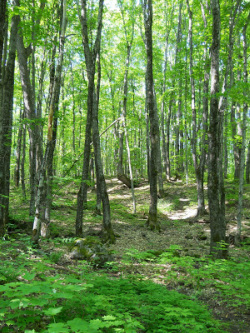 NORTH COUNTRY TRAIL - This National Scenic Trail stretches 4,600 miles linking communities and wilderness areas across 7 northern states stretching in segments from Dakotas to Vermont and through Hurley, Mercer and Ironwood Township at Rainbow Falls near Lake Superior's Black River Harbor - just 12 miles from Powder Hound. Developed during the summer of 1999, the trail is part of the Wolverine Nordic Trails and maintained by the Wolverine Ski Club and Tuesday Night Fat Tire Club. The Schnake Trail, the other singletrack trail in this route, is a roller coaster ride with challenges of its own, but the well-marked Wolverine Nordic Trails are not just about getting pounded by singletrack. Views of forest, brightly colored with splashes of red and orange during autumn, greet you as you climb up the ski slopes of the Big Powderhorn Ski Area. Tread: 3.7 miles of singletrack, 5.1 miles of wide, grassy trail. A day trip from PHL - the park entrance about 45 mins - 1h drive offers spectacular hiking trails, amazing views and wheelchair accessibility. 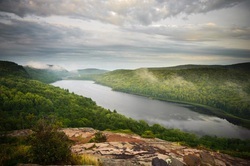 Lake of the Clouds Overlook, at the end of M-107, is one of the state's most famous views. 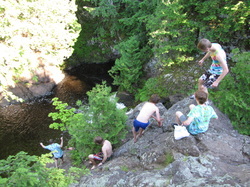 From a dramatic rocky ridge you can look down over the Big Carp River Valley. This scenic overlook has a parking lot, and is wheelchair-accessible. 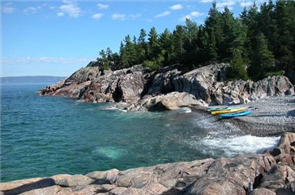 If camping is on your agenda, 12 miles down Black River Scenic Byway is Black River Harbor Campground with 40 sites on the bluff overlooking Lake Superior. Powder Hound Lodge is a great Base Camp for day hikes and camping excursions. Book direct with Black River Harbor Campground. Kayak tours and adventures available through our local outfitter in Ironwood. Contact Whitecap Outfitters for more information. There's a flourishing arts community in the Western Upper Peninsula with studios and galleries popping up often. Glass blowing to ironworks, there are collaborations, classes, events offered frequently. Kikkebusch Glassworks in Bessemer. Glass art, metal sculptures. Glass blowing lessons by request. 906Boom on Aurora. Visit Char's Flying Fish Studio for hand crafted jewelry, Tori House gallery, Lake Superior Tai Chi, Ironwood WERKS pottery and wood shop and more. Schneller Art Gallery - Hwy 2. Visit Kevin Schneller's gallery - known for his stunning Northern Lights images. Ironwood's Downtown Art Place offers a collection of local artwork in the gallery/shop. Art Studios on Aurora - pick up a unique piece of art right out of the artists' studios. Amy Anderson at Black Jack (winters) - local artist and painter. Dancing Raven Studio in Ironwood - Visit Amanda Szot for bead work & unique sculptures. Z Place Gallery on Hwy 2 for local artwork. Nanette's Knits in Wakefield. Great knitting shop and alpaca farmer, Nanette will help with any of your knitting needs. Local Co-Op: Northwinds Co-op in downtown Ironwood offers organic produce, natural foods. Local Farmer's Markets: There are three in the immediate area. Ironwood Township Farmers and Craft Market - Tuesdays 4-7. 906.932.5800 - Goods must be home made or hand made. Besides Wilderness Areas and specifically designated hiker-only trails (including the North Country National Scenic Trail), the entire National Forest is open to mountain bikes. This includes closed, gated and blocked roads unless the road is specifically closed to bicycles. Many of the designated mountain bike trails are also open to other uses including, motor vehicle travel, ATV's, ORV's, snowmobiles, hikers, and horses so please be careful and share the trail. Mountain bike trails travel through a variety of management areas across the National Forest. These areas are managed for a wide range of multiple use activities including recreation, threatened and endangered species, fish and wildlife, water quality, and wood products. THINGS TO KNOW: To help prevent erosion please stay on the roads and trails. Please do not block any gates. 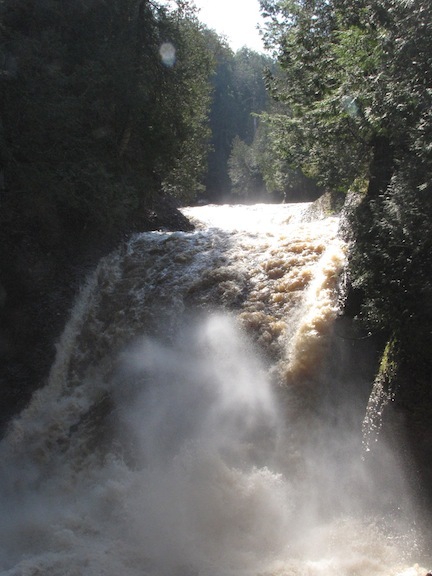 For additional information or maps of Ottawa National Forest Roads and trails call (906) 932-1330.